Model was designed and built completely from scratch. My main raw material were styrene sheets (0,2 and 1 mm thick). Front of the chestpiece was additionaly covered by two plexiglas panels. 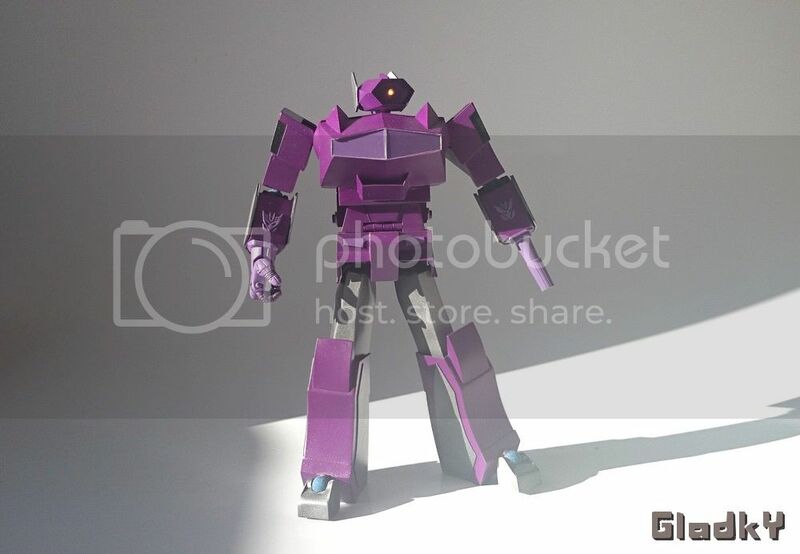 My Shockwave is inspiered by his appearance in Generation 1 with some slight detail changes. 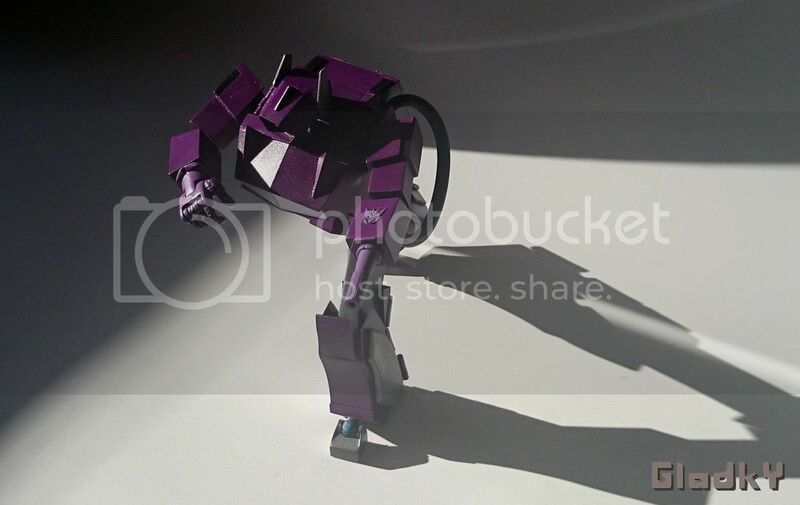 It has many points of articulation including articulated fingers and wristjoint. Compilation of all the joints makes some really nice poses possible. 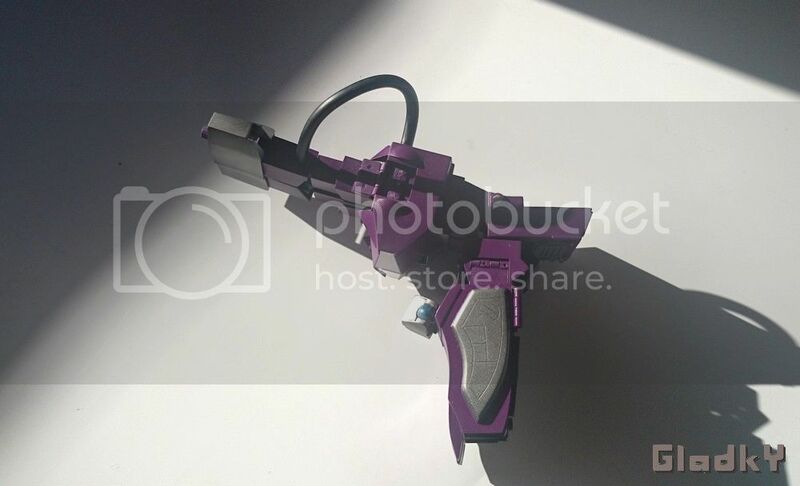 Model has six LEDs that were built in Shockwave's eye, gunarm and backpack. Battery is easily accessible by magnetic hatch on the backpack. 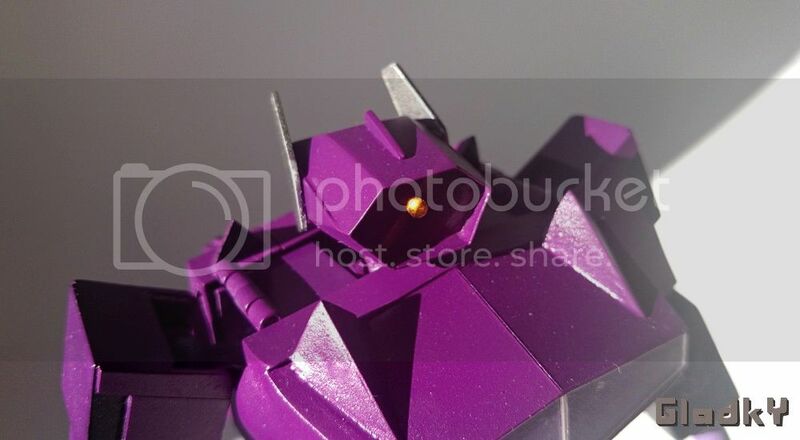 Backpack has four LEDs installed within it, which simulate level of energon. I installed four additional hinges in the waist that allow for more leg movement without huge holes near the hipjoint. 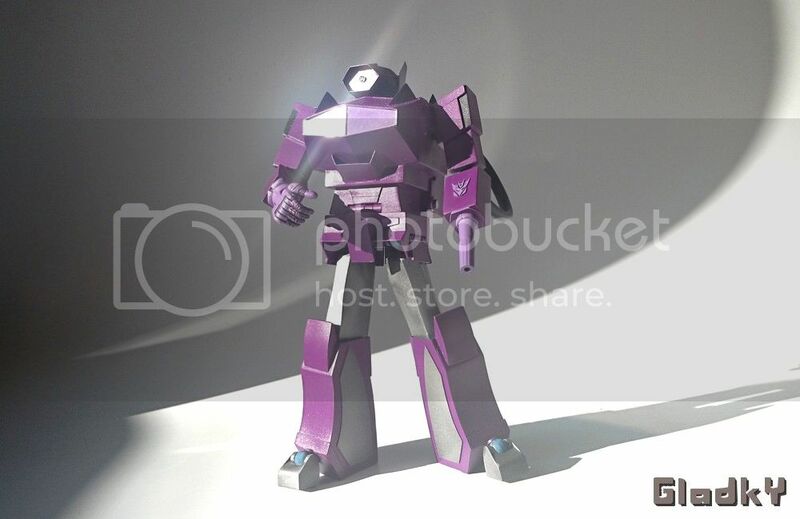 Shockwave has a few small nice details like hand cut miniature Decepticon insignia on forearms and shoulder panels, both of which are inspired by original design. 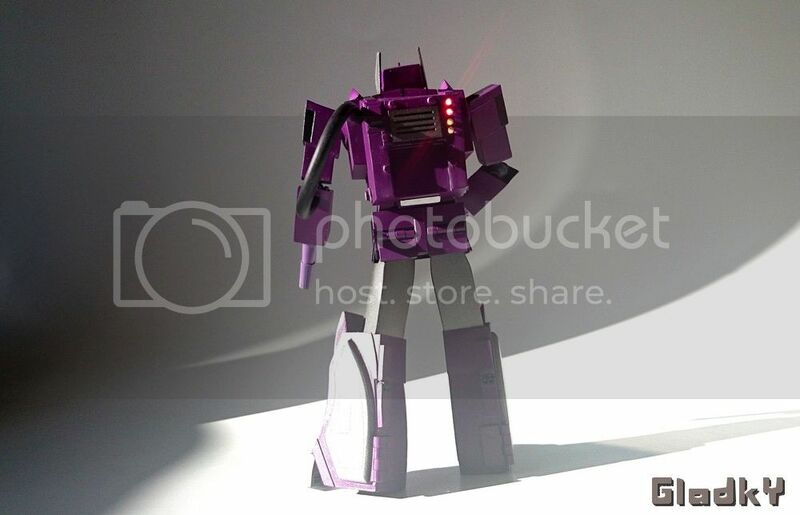 When electronics are turned on Shockwave's eye shines with bright yellow light. 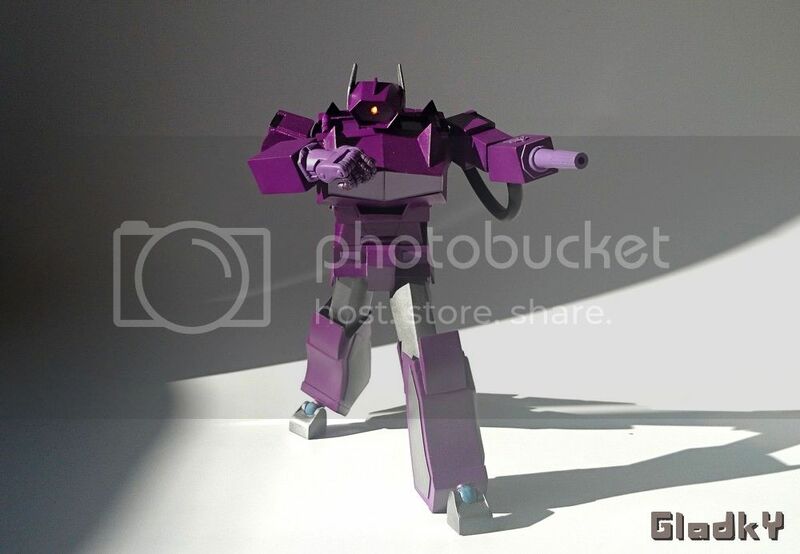 Whole model was carefully painted and covered with clearcoat to match original Shockwave's style and to look good next to other MPs. Speaking about other Mps. 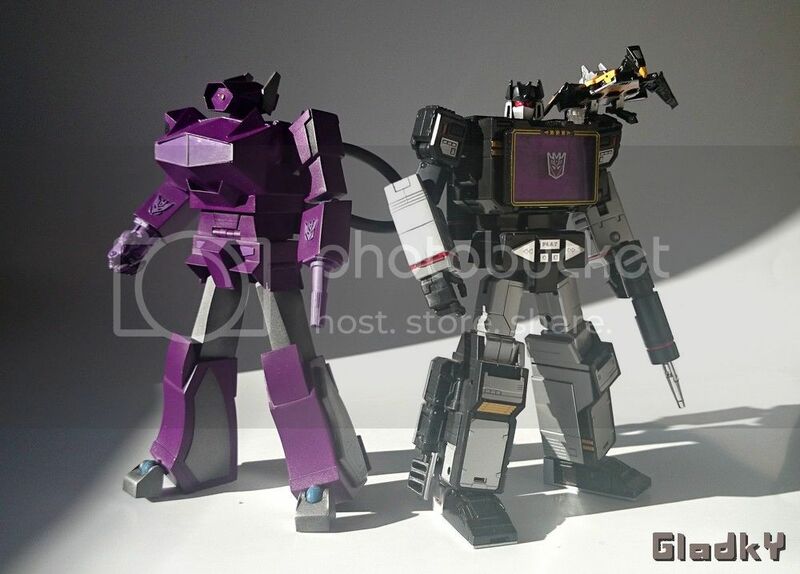 Shockwave is about the same height as Masterpiece Soundwave. I think those two look really good together. 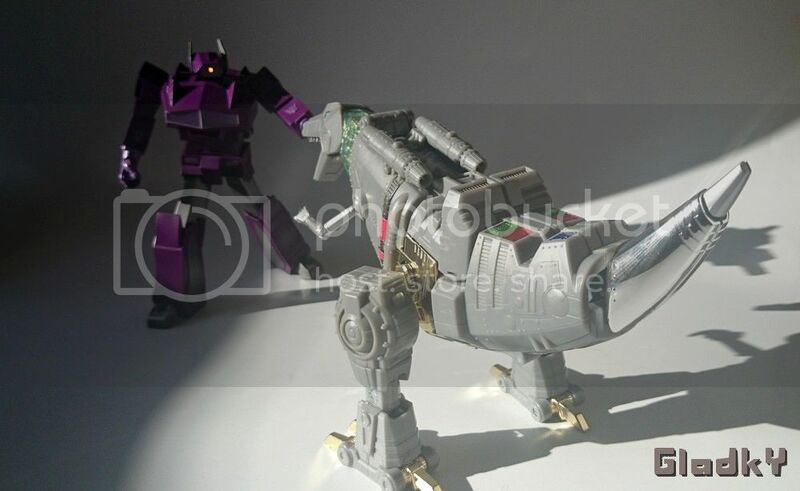 Decepticon is also not afraid to fight Angry Grimlock. 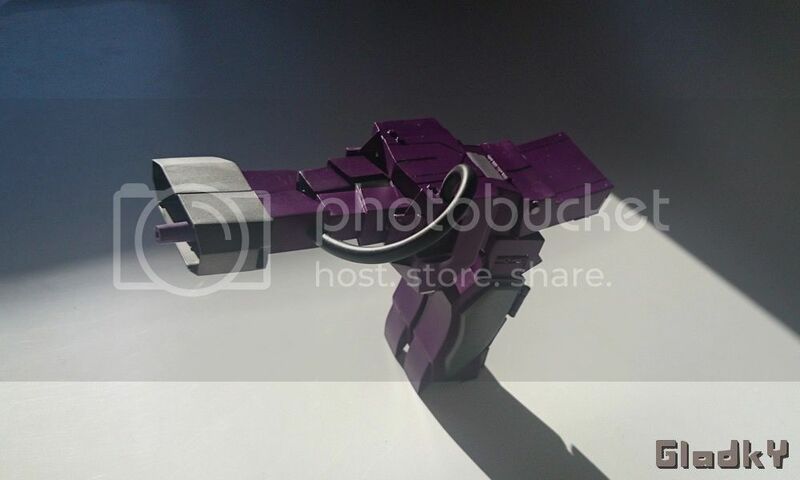 Shockwave's forearms are built in a way that allows to put halves of the gun mode cover on them. I also installed metal pieces within covers and magnets inside forearms to make sure those will stay together. 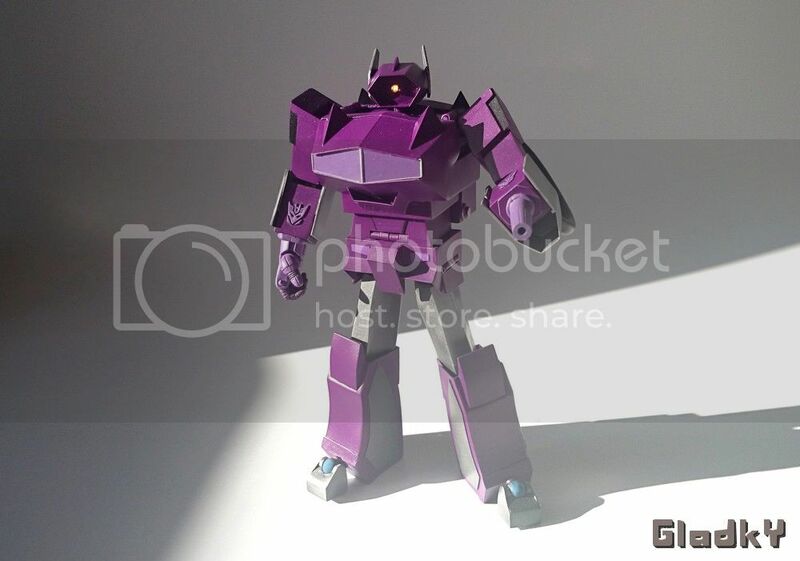 Custom is fully transformable. The result is huge cannon inspired by G1 alt mode. Thanks to special flaps on the back of the robot mode legs cannon can stand by its own. 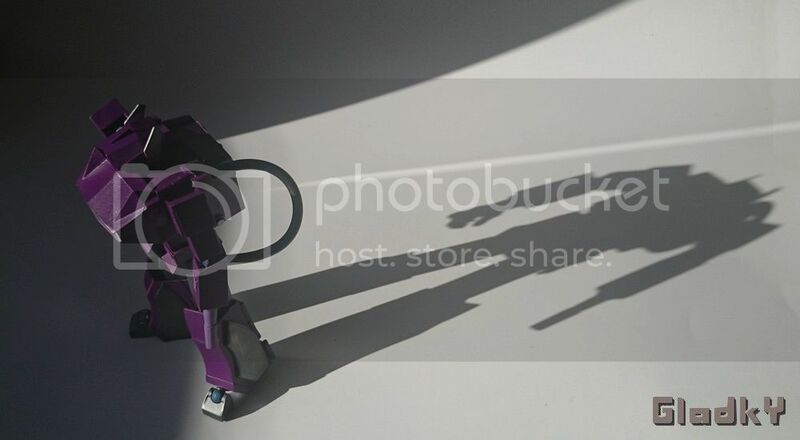 I leave You with one more Shockwave's photo before he can join other Decepticons on my Masterpiece shelf. That's all I wanted to show You today. I hope You like it. Please feel free to comment. 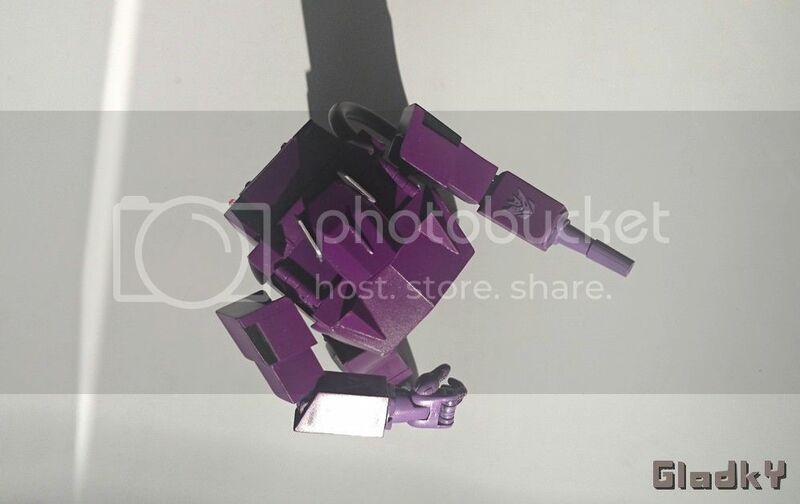 At first I thought it was non-transformable. Glad to see I was wrong. Very well thought out. 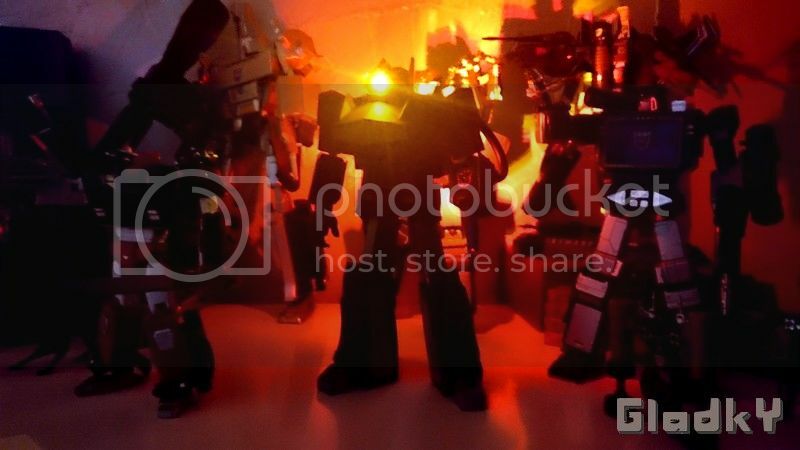 Transform to become your ultimate self"
That's an amazing piece of Transformers art you made there. Do you accept commissions? If not, are you going too? 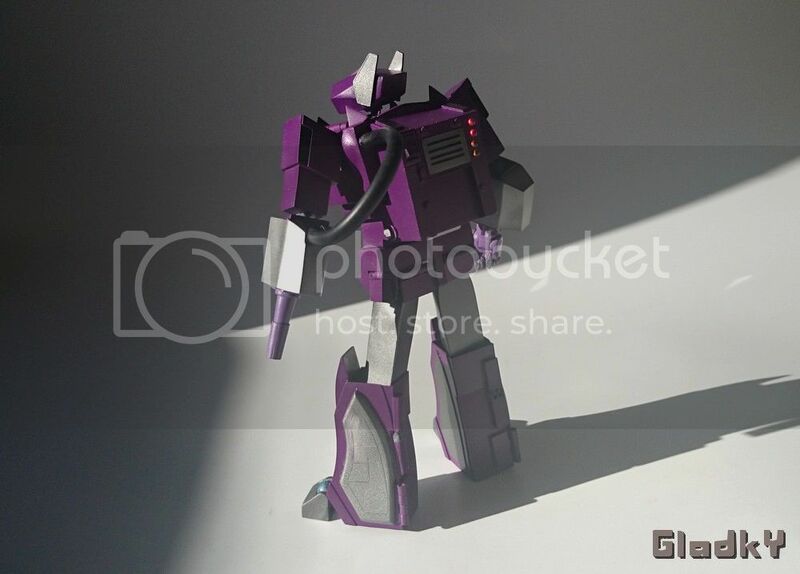 If you do so, how much for an custom MP Shockwave as you made already? "Transform to become your ultimate self"
That is awesome! 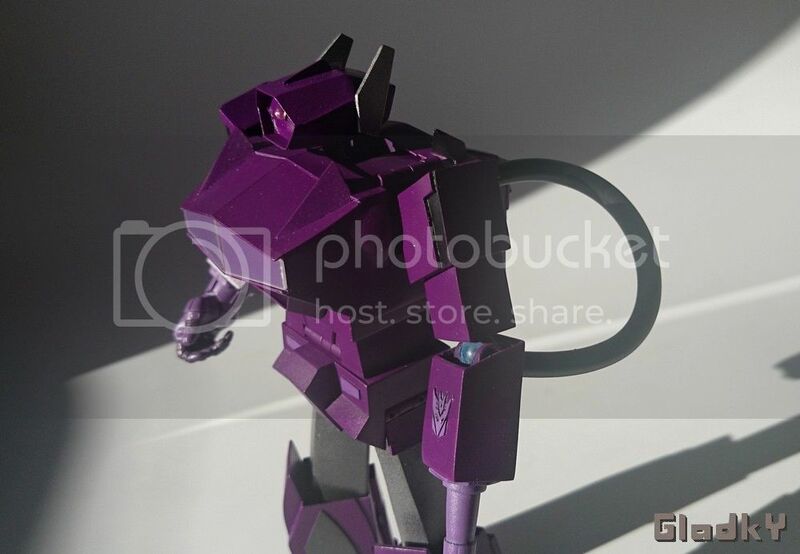 Making a transformable scratch custom is incredibly hard and anyone who can make it is amazing! 4,972 pages were recently viewed by 883 unique visitors. This page was viewed 1 times on Monday, April 22nd 2019 1:09pm CDT. © 2019 Seibertron, Inc. DBA Seibertron.com. All Rights Reserved. Established June 2000. Seibertron.com is owned by Ryan Yzquierdo.